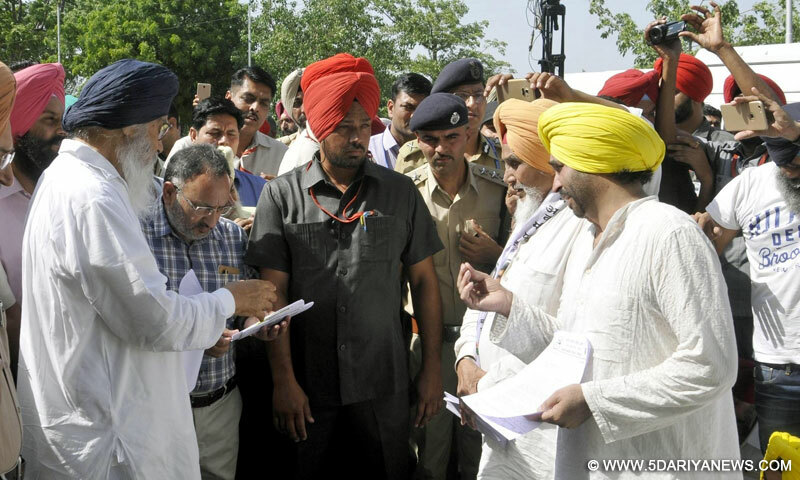 Aam Aadmi Party (AAP) workers lead by party leaders Bhagwant Mann, Sucha Singh Chhotepur submit a memorandum against the Punjab government to Punjab Chief Minister Parkash Singh Badal in Chandigarh on May 16, 2016. The Aam Aadmi Party on Monday said Punjab Chief Minister Parkash Singh Badal was "evasive and non-committal" on various issues like scams, corruption and suicides by farmers in the state. "He was evasive and non-committal on most issues like the food grain scam, corruption, suicides by farmers and the mafia rule," senior AAP leader and Punjab affairs incharge Sanjay Singh told the media here after a brief meeting with Badal outside the chief minister's residence.Sanjay Singh was part of the AAP delegation that met Badal, who walked out of his official residence in Chandigarh's upscale Sector 2 amid unprecedented security to meet the delegation members.On the other hand, Badal said most issues raised by the AAP were under the purview of the central government. Earlier, nearly 15,000 AAP activists gathered at the Dussehra Ground near Phase 7 in Mohali town, adjoining Chandigarh, as part of their proposed march towards Badal's Chandigarh residence. However, the AAP activists were stopped at the Mohali-Chandigarh border by the Chandigarh Police.Later, the delegation of AAP leaders, including Sanjay Singh, state convenor Sucha Singh Chottepur, Sangrur MP Bhagwant Mann and actor-comedian Gurpreet Ghuggi, was escorted by police to meet acting Punjab Governor Kaptan Singh Solanki and Badal.The delegation met Solanki at the Punjab Raj Bhavan here before their meeting with Badal.Security in and around Chandigarh was tightened on Monday ahead of the AAP protest against the Punjab government's alleged failure to probe the Rs.12,000 crore food grain scam and curb the menace of drugs, mafia and corruption. The area around the official residences of the chief minister and his son and Deputy Chief Minister Sukhbir Singh Badal was barricaded by Chandigarh Police since Monday morning. Scores of police personnel, many of them in anti-riot gear, were also deployed.Chandigarh Police personnel were also deployed around the Haryana and Punjab Raj Bhavans.Security was also increased at all entry points to Chandigarh, the joint capital of Punjab and Haryana, to stop the AAP activists from moving close to the VIP residences.The chief minister had cancelled all his official engagements for Monday to receive AAP leaders who wished to protest outside his official residence.The Punjab assembly elections are likely to be held in February next year.